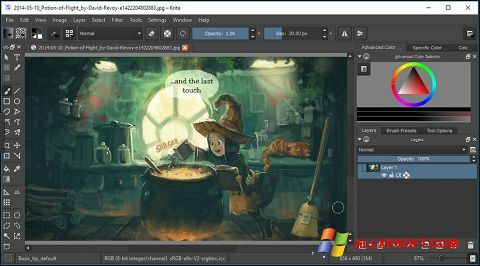 Krita for Windows XP - cross-platform image editor, open source, allowing the flexibility to customize the functions and processing tools for themselves. The main purpose of the software tool is the processing of raster graphics, aimed at individual creative projects or additions of artists and photographers. The application supports a huge number of brushes, a variety of effects overlay, styling paper and pastels, the integration of a variety of graphics tablets. You can free download Krita official latest version for Windows XP in English.